The architects will present an updated floor plan and concept designs following community input at the January design workshop. The Tallarook Mechanics Hall Institute meeting scheduled for 5 February has been postponed after the Committee of Management was notified it had been accepted in the Regional Arts Victoria Mentoring Program. This means a mentor will liaise with the project’s architect to support the design of the hall’s internal fit out for events. This is an exciting development but will lead to a delay in the next steps of the project. A new meeting date is TBC. 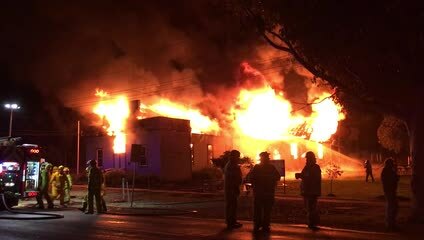 The rebuild of the historic Tallarook Mechanics Institute Hall is one step closer, with a design for the new building close to being finalised eight months after it was gutted by fire. The final meeting for community input in to the rebuild, after which designs for the new hall will be finalised. We've been working with the insurer, builder and committee on the rebuild plans. We're in the process of engaging an architect. We're hoping to hold a community workshop on 8 December. Date and details to be confirmed once the architect has been appointed. Sign up for our email details to be notified. The insurance company will be attending the next community meeting (6pm, Tuesday 28 August at the Recreation Reserve Pavilion). This is your chance to hear first hand what's involved in rebuilding through the insurance company or, alternatively, how a cash payout would work. We'll then be in a better position to have some more detailed discussion around the pros and cons of getting the insurers to manage the rebuild compared to accepting a cash payout and getting Council to manage the rebuild. Thank you to everyone who completed the rebuilding survey. You can download a summary of the results here (PDF download). Recovery committee members visited a number of local halls at the end of June to get an idea of what has worked well in recent hall buildings and renovations. With demolition of the iconic Tallarook Mechanics Institute complete this week, the Tallarook community is coming together to prepare plans for a new hall. Established in 1891, the hall was destroyed by fire earlier this month. The rebuild will be funded largely through insurance. Thanks to Jaclyn Symes MP, the Victorian Government has also committed up to $200,000 to assist with the rebuild and with replacement of contents. There have also been many offers of assistance and fundraising opportunities made to the Committee of Management. Following two community meetings, a rebuilding committee is now being established in partnership with Council and the Committee of Management to work on plans for the rebuild. Mitchell Shire Mayor Rhonda Sanderson said there were many great ideas in the community about the rebuild and the extra funding meant it was possible to consider a range of possibilities. “Through the recovery committee we’re asking people to think about things such as whether they would like to move the hall slightly to avoid the creek which has caused some flooding problems in the past or whether they’d like to move the location within the site even more,” Cr Sanderson said. “The hall has a great history of all sorts of community uses over the years and we’d like to know what type of uses people would like to see for the future. The rebuilding committee will meet at 6pm on Tuesday 29 May at the Tallarook Recreation Reserve Pavilion. All welcome.